Buddhist carved panels from Mian Khan, Peshawar District..
bl.uk > Online Gallery Home	> Online exhibitions	> Asia, Pacific and Africa Collections	> Buddhist carved panels from Mian Khan, Peshawar District.. 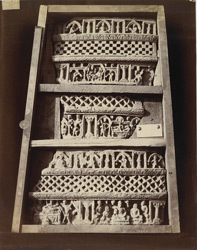 Photograph of Buddhist carved panels from Mian Khan in Peshawar district. This print shows the sculpture pieces boxed for transportation. The pieces illustrate Maya's dream, the Buddha preaching and Buddha's death. According to Bloch the panels are 'said to be in Bombay'.